We understand your fears and concerns. At our Indiana law firm, attorneys Richard Kammen, Josh Moudy and Grace Atwater take the time to listen to you and thoroughly review your case. We are here to answer any questions you may have and we will walk you through the legal process step by step. The attorneys at Kammen & Moudy have more than 50 years of combined legal experience and it's this experience that is crucial, whether we're fighting to protect your rights outside the courtroom, during trial proceedings or during the course of an appeal. 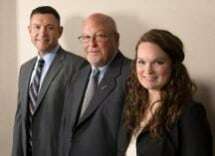 When you choose the attorneys at Kammen & Moudy, you can be confident in your legal team. If you're facing serious criminal charges, such as a federal drug charge or a white collar crime, or have a family member who was arrested and needs legal advice, talk to the lawyers at Kammen & Moudy. Contact our Indianapolis law office to take advantage of a free initial consultation and see how our firm will help you through a difficult time.